49th Annual Earth Day is Approaching! Santa Barbara is the birthplace and home of Earth Day, which started the April after the 1969 oil spill. The Community Environmental Council (CEC) was founded this same year, and to this day runs our annual Santa Barbara Earth Day Festival. Learn more about the history of Earth Day, CEC, and the Santa Barbara environmental movement. As a parter of CEC for nine consecutive years, Oniracom is committed to educating the community and taking action towards creative solutions to the toughest environmental problems our world faces. This year's festival features a new Opening Night Concert at the Main Stage with Beer & Wine Garden on Friday, April 26, to kick off two full days of entertainment, education and community building on April 27 & 28 at Alameda Park. Check out the Earth Day Commercial our video team created to promote the event! CEC’s Earth Day Festival is broken into zones, each created around a specific theme. 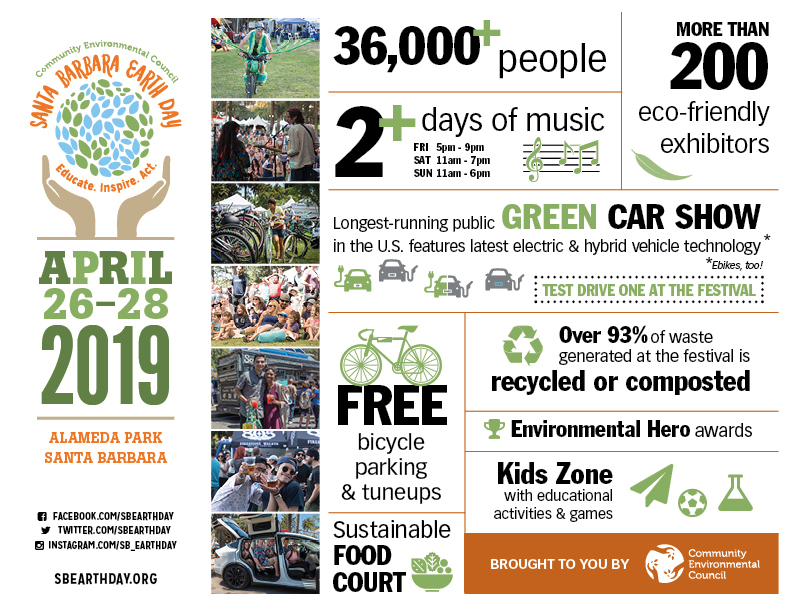 In addition, there will be two full days of live music performances, speakers, one of the largest Green Car Shows on the West Coast, family programming, and the presentation of Environmental Hero Awards. Earth Day features regional leaders in planetary protection, eco-business and community. Tens of thousands come together from the central and south coast to celebrate, connect and recharge. CEC’s Santa Barbara Earth Day Festival is a true community event. Each year, over 300 volunteers come out to bring the festival alive. Sign up today! For more detailed schedules, festival maps, and more information visit http://sbearthday.org.